The Oyama CFS-B18U rice cooker is the larger 10 cup version of the slightly smaller CFS-B12U rice cooker which is the 7 cup unit. Both of these Oyama rice cooker models look the same, perform the same, and offer the same benefits. It was only until now that we realized they were indeed the same type of cooker minus cup capacity, but for the sake of keeping folks on this page, we’ll continue our review of this 10 cup cooker. As far as we gathered, this 10 cup stainless steel rice cooker receives a majority of positive customer feedback reviews, and like its smaller brother turns out good quality white rice, with decent brown rice, wild, mixed jasmine etc. Expect a small learning curve for other varieties for desired texture. It is the perfect sized cooker for large households and can yield around 30 cups or so of cooked white rice (in rice cooker cup measurements) and also comes with a steaming tray allowing the user to simultaneously steam food while the rice cooks below. 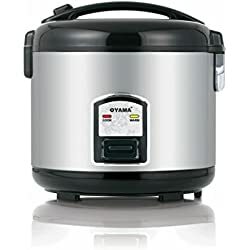 Another thing we found folks favored with this Oyama CFS-B18U rice cooker is that the inner bowl has a stainless steel lining as opposed to non-stick material. However the only con is that there are sticking and crusting issues that occur. Soaking in warm water for several minutes does make clean up a snap though and is not that much of a chore. The cooker comes with a stainless steel steaming tray, measuring cup, rice paddle, condensation collector and manual. Overall, we found the same pros & cons with the Oyama CFS-B18U rice cooker that the small CFS-B12U 7 cup cooker has. However, with a current 4 Star Rating on Amazon.com and a majority of positive consumer feedback, for the price, we believe this is a nice 10 cup stainless steel rice cooker to go with. The very fact that this cooker can also steam a decent amount of food always gets our attention and helps us favor it over models that do not offer this additional handy feature.